The PIAA State Dual Tournament is over. 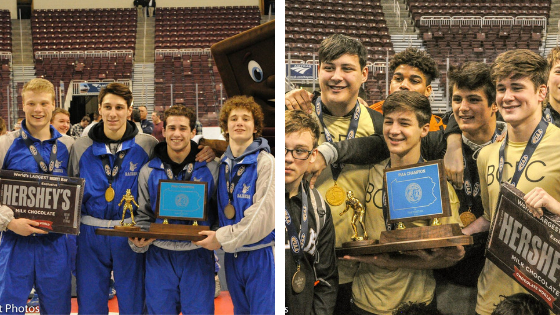 Perennial powers Reynolds and Bethlehem Catholic were crowned Champions. Following a long weekend in Hershey, here are updated State Dual Team rankings. In Pennsylvania’s Class 3A State Dual Team Rankings the most obvious fact is that District 11 occupies six of the top twelve ranked teams in the State. Bethlehem Catholic and Northampton hold the top two spots after clashing in the State finals on Saturday. The third and fourth place teams out of District 11 aren’t far behind with Liberty coming in at #4 and Nazareth at #5 in the State. #9 Stroudsburg and #12 Easton Area make it six District 11 teams in the top twelve. In case you forgot District 11 only qualifies two teams into the PIAA State Dual Team Championship. This season Liberty defeated District 1 teams, and State Dual Team Qualifiers, Boyertown Area (43-23) and Owen J. Roberts (60-8). They own a defeat over eventual State Champions Bethlehem Catholic (32-30) and also State Runner-ups Northampton Area (32-28). Liberty took on Nazareth Area three times this season and went (2-1) against the Blue Eagles. Additionally they defeated Stroudsburg (43-21). Nazareth Area defeated both Easton and Stroudsburg twice this season and went (1-2) against Liberty. The Easton Area Red Rovers, on the other hand, took out District 1 Runner-up Spring-Ford (39-29). You can’t blame me for having Brookville at #10 heading into the PIAA State Dual Team Championship. They lost to Greenville (37-33) during the first weekend of competition, struggled in a win over Redbank Valley (33-28), and twice let Brockway Area come within upset range winning (38-22) and (32-29). Then the State Dual Team Tournament happened and that all changed. They opened up with a (40-26) win over a mediocre Lake Lehmen team before facing off with undefeated Southern Columbia in the quarterfinals. Despite dropping a (51-21) match to the Tigers – Brookville went on a roll in the consolation defeating #4 Muncy, #11 Notre Dame – Green Pond, and #3 Saucon Valley en route to the third place match. As someone who eats, sleeps, and breaths Wrestling I am not one for basketball but I do enjoy filling out a “March Madness” bracket each year. No matter what their seed is I always advance Gonzaga to the Sweet 16 – every year. Why? Because they always seem to be ready and down when March rolls around. They may not have a ton of future NBA stars on their line-up but they out work and hustle their opponents. I feel like Chestnut Ridge is always like that. They thrive in the GIANT Center as a team and always bring a certain something that I can’t quite put my finger on. 2019 was no different as the Lions roared their way into the third place medal match after giving Southern Columbia all they could handle in a (34-31) defeat. In true Chestnut Ridge fashion they found a way to win against Burrell (32-29) and earned convincing victories over Hamburg Area (42-18) and Brookville Area (46-18).